The product is a free version of the Expert Advisor having the same name. Unlike the full version, the EA only trades a fixed lot with the minimum volume. It uses a trading algorithm based on the price movement for analyzing the market conditions. TakeProfit and StopLoss values can be set manually or automatically by the EA. Positions are closed by a profit, time or after reaching TakeProfit or StopLoss level. The EA uses neither martingale, nor hedging and needs no complex setup. Suitable for trading instruments with three or five decimal places. Optimized for trading EURUSD M15. It is possible to set the maximum spread size but not more than 20 points. Trading in a certain day of week can be enabled. It works best on the EURUSD M15. M‌agic - EA's order magic number. S‌lippage - slippage in pips. Recommended values are 0 to 3. S‌topLoss - StopLoss value. If 0, the value is calculated and placed by the EA. T‌akeProfit - TakeProfit value in pips. If 0, the value is calculated and placed by the EA. 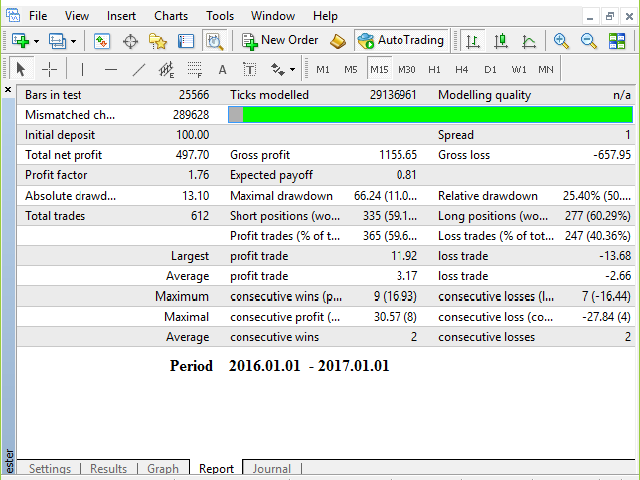 M‌ax_Spread - maximum allowed spread size for opening positions, in points. M‌ax_Lot - maximum allowed lot size. T‌imeTrade - trading time settings. O‌penHour - trading start hour. O‌penMinute - trading start minute. C‌loseHour - trading end hour. C‌loseMinute - trading end minute. MarketWatch - for the brokers that do not allow to set StopLoss, TakeProfit simultaneously with position opening. Average_Ratio - lot multiplier for averaging orders. Recommended values are 1 to 5. Why u not give setup (Preset) file / what perametar i use ?? One of the few expert advisor that realy makes profits in time. Testing is good, but real trade is too risky :) my rating only for testing on demo. now i decide that your robot totally fake, fraud system, i found in my account just real 20$ lost, 0.01 lot, all order just worst. No live signal means it doesn't work ... Don't trust EAs without a live signal ! Can i edit minimum lot size? not impressive, too much operation. Very impressive EA. More gains than losses. Default value for lots (0.04) seems a little high and I personally like to set my own money management, but results speak for themselves. Currently testing other currency pairs (USDJPY and GBPUSD) and will update review eventually. One month of testing on 2 accounts, same broker with same server and mql5 vps. Very different results on the 2 accounts, 1 wins and 1 loses. Or the strategy is very mysterious, or the ea cheats in backtest and is just a random trader on live trading... And this explains why the author has no signal to show. I don't trust it at all ! The EA is the total scrap. I do not understand people who offer such a crap. Очень доволен им. Сам он конечно не очень торгует, но направление указывает верное, так что если корректировать его, то отличный результат дает. Seems to work well with EURUSD on short timeframes but no other majors, just a small profit on USDCHF. Also gives profit on XAUUSD M5 with TP100&SL1000 config. 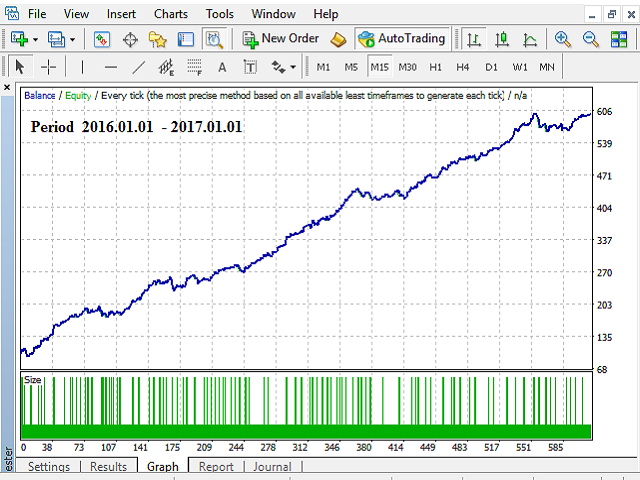 Backtested on January 2017, next week going on forward test. Removed ban on opening positions with a spread of more than 20 points. Corrected the work of averaging positions. Added the Average_Ratio input parameter. Corrected the operation algorithm of the module responsible for analysis of the currency pair's "overbought - oversold" states. Removed the prohibition of trading on timeframes above H1. Added prohibition of trading on the days of USD and EUR interest rate announcement. Modified the market entry algorithm. Removed the Max_Lot input parameter. Added market news filtering, namely, trading is stopped before the release of high-impact news.